Rodman Reservoir is legendary due to the number of trophy bass it has produced for fisherman over the years since its creation. It has been consistently ranked as one of the top ten best bass lakes in the country. Explore the swamp a historic extension of the St. Johns River. View wildlife in their natural habitat while experiencing the thrill of fishing on this 6-hour trip. This activity is suited for first-timers and experienced anglers. This activity is great for all ages and the boat is accessible for all physical abilities. All fishing equipment and safety gear included. You will want to plan to be at the meeting location approximately 15 minutes in advance. After meeting your licensed captain guide at the departure point, set sail on a modern 20' boat. Whether you’re looking for a great fishing charter or an incredible sightseeing experience, this Rodman Reservoir tour will accomplish both. 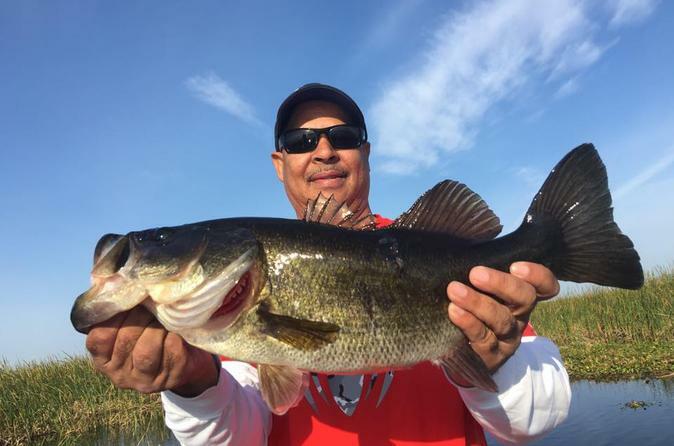 See birds and alligators flourish in the abundance of vegetation making it a bird watcher's heaven and a photographer’s paradise, but for anglers it’s truly both. Your captain will provide a tour and sightseeing experience second to none with a goal that everyone participating will catch a trophy bass. While out on the water, all the boats have coolers on board with ice and bottled water to keep you hydrated. There's plenty of space to bring lunch sandwiches or your additional favorite beverage. Alcohol beverages in cans are permitted. Once your boat docks, this will conclude your trip.